Your operations manager is coasting along, scheduling jobs and matching the engineer to the task. The day is going great: Your engineers are on time, jobs are successful, and both your customers and your engineers are happy. Then it happens: Some sort of glitch causes one engineer to be late. Your operations manager scrambles to redo the schedule, but then a customer calls to make a rush appointment under your service level agreement. This dominoes into an entire day-full of missed jobs, failed fixes, and upset customers. No matter how skilled your operations manager is, they can handle only so many engineers at a time, and there’s only so much they can do using nothing but a diary management system and their intuition. Small, common scheduling issues, over time, affect almost every department in a growing fire and security, electrical, plumbing and heating, property management, or HVAC business. They also impact customer satisfaction, which of course puts a stopper in your growth. So let’s talk about the most common day-to-day issues that crop up for your operations manager, and how they can snowball into a big problem. If you'd like to skip straight to the solutions, you can download our free report on how automated systems are helping growing field service businesses streamline their scheduling. Don’t let your growing field service business be blindsided by these small scheduling problems that, when combined, add up to huge issues. Small Scheduling Problem #1: An engineer calls in sick, or has to leave early due to sickness. 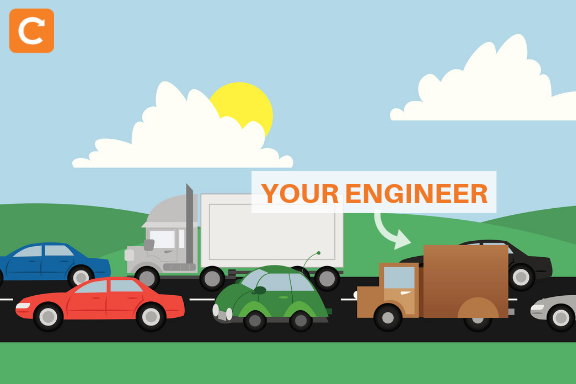 Small Scheduling Problem #2: An engineer is stuck in traffic. Small Scheduling Problem #3: The customer cancels or reschedules the job at the last minute. Small Scheduling Problem #4: The engineer arrives on site and the customer isn’t there. Small Scheduling Problem #5: An emergency job comes in. Small Scheduling Problem #6: You’re suddenly hit with more jobs than you have resources for. Small Scheduling Problem #7: The engineer that shows up doesn’t have the right parts and has to reschedule the appointment. For more details on the impact these problems have on your business, read on. Sometimes engineers get sick, and they can’t come to work when you were expecting them. The average worker in the private construction industry, for example, takes 4.8 sick days per year, versus the national average among all workers of 4.1 days, reports the Office for National Statistics. That means if you have 50 engineers in your construction business, your operations manager will have to deal with a no-show engineer 240 times each year. And what about those engineers who don’t call in sick...when they really should? Seventy percent of workers go to work even when they’re sick, according to The Independent. We can only assume that some of them end up being sick enough that they have to leave work early. Your operations manager needs to readjust the schedule every time this happens. The worse congestion becomes, and the longer travel times get, the more likely it is that your engineers will run late at some point. Late engineers are one of the five biggest customer complaints about field service businesses, so of course you want to avoid this. With schedule optimisation software, your operations manager could quickly revise the schedule and divert a closer engineer to the job site. Without it, you have an engineer sitting in traffic—and an unhappy customer. The service window is too wide and they got tired of waiting. Your engineer is running late and the customer can’t wait any longer at the job site. The customer is experiencing a personal or business problem. The customer fixed the problem themselves, or decided it didn’t need to be fixed after all. The customer decided the cost is too high. Each time this happens, your operations manager has an engineer who has nothing to do. But what if that engineer is now in the perfect position to get to another job on the roster? Without a system that uses intelligent scheduling optimisation, the only way to take advantage of this opportunity is to manually reshuffle the entire schedule. As we discussed in the previous point about customer cancellations and rescheduling, intelligent scheduling optimisation software can revise the schedule in real time, to keep all your engineers busy when an engineer can’t access a job site. At certain times of the year, your operations manager can examine historical data to predict when you’ll get a lot of emergency calls and schedule accordingly. For example, plumbing businesses will get emergency calls for burst pipes and loss of heat in the winter and property management companies will get calls about pests and AC breakdowns in the summer. But emergencies aren’t totally predictable—that’s why they’re called emergencies. When a customer calls, especially if you have a service level agreement with the customer, your operations manager’s task is to fit them in no matter what. This is a problem when your schedule is already packed with jobs and the operations manager has to redo the schedule using traditional diary management software. Then there are those times outside the typical busy season, where all of a sudden everyone in your city seems to be having a problem with their alarm system or plumbing. You go straight from a lull into full-on crisis mode, and your operations manager is rushing to keep up with the demand. This is the Traveling Salesman Problem, where the calculations get more and more complex the more places someone has to visit in a day. In the case of field service, the operations manager uses their diary management software, their knowledge of the engineers, and a mapping system to get the schedule looking good—until the next call comes in. Small Scheduling Problem #7: The engineer doesn’t have the right parts and has to reschedule the appointment. If your operations manager is using traditional diary management software, this problem is more likely to happen; with some intelligent scheduling systems, on the other hand, the algorithm takes into account what parts are in stock and which service van they’re in. These seven scheduling problems all seem tiny when looked at individually, but when they keep happening—alone and in combination with other problems—they turn into massive roadblocks for your business’s growth. Discover the solutions by downloading our free report “How Intelligent Scheduling Is Changing the Way Field Service Businesses Plan Their Work” below.